As Marko Perisic (pictured) General Manager Dynamics 365 Business Central (as it is now named) opened the keynote on day one, he spoke with pride of what the Dynamics team have achieved over the past 6 months, the product they have made ready to release to the market and all the amazing outcomes that have come to the surface. Not to mention the pedigree from which Dynamics NAV has, as a Microsoft partner you can’t help but feel it’s good to be alive today in our industry, there are so many exciting changes happening right now and it really makes what we do fun and exciting. But looking back at how far we have come as an ecosystem and a product, can you believe Dynamics NAV has been in the market for 31 years. That stat alone is a great achievement, for a product to innovate and remain one of the best offerings on the market for over 3 decades. I guess it’s no surprise when I look at how that looks on a global scale, with 160,000 customers, 2.7 Million users and used in 195 countries it has a big footprint. All this is serviced by a massive partner network consisting of over 3,500 partners, you can see why companies trust and invest in the Microsoft platform. There was also great information about deployment options, discussions around the value of the new product and further improvements to the development environment. Microsoft really is putting a huge effort into this amazing product and making a great product even better. 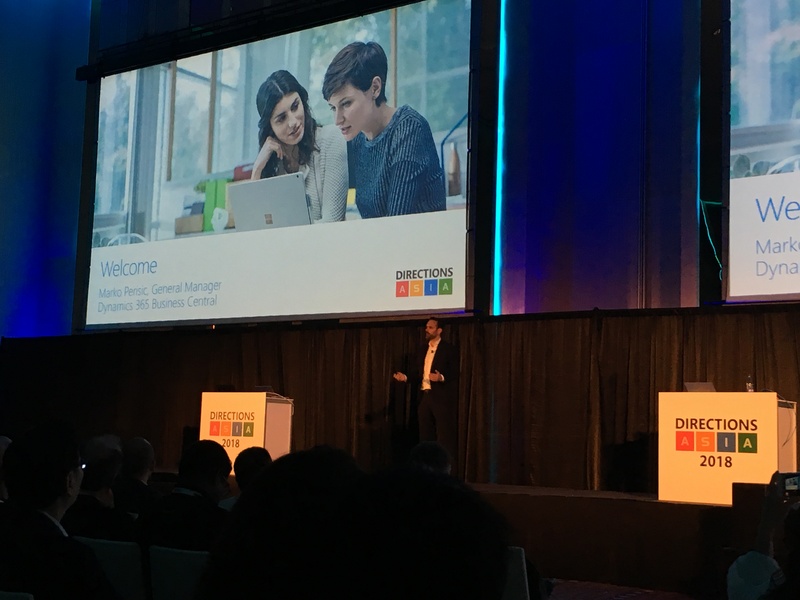 We can’t wait to get our hands on Dynamics 365 Business Central and show it to our clients and prospects, as we are sure they will agree with us that this truly is a fantastic product. I think the value of EBS going to conferences like Directions is very high, we get to be on the cutting edge of the Microsoft technology, talk to the Microsoft development team and put our concerns or questions to them, the team really are a great bunch of people and it’s always good to have some face to face time. We also get to share discussions with other Microsoft partners and compare notes, it a great community and we all work together. As Microsoft say, their best asset is their partner network, I believe our best asset as a company that looks to solve business problems for our customers is the fact to we are solving these problems with Microsoft technology, which is evolving exponentially every day. What a great time to live in the business software space, how can you not love it? Directions ASIA is a must-attend conference for Microsoft Dynamics Partners from Asia, Australia, and New Zealand, as well as Partners from other regions operating on the Asia-Pacific SMB market. Build agile and knowable Dynamics Partner community in Asia to support the business growth of Partner companies. Provide opportunities for independent software vendors to showcase their solutions to the Dynamics Partner forum and demonstrate their readiness to Dynamics 365 as SaaS providers. Provide first-hand knowledge from Microsoft about the Microsoft Dynamics Roadmap and new features of the latest Dynamics NAV versions (Business Central). Support partners in developing readiness for Dynamics 365, offering a deep insight into apps for Finance and Operations, as well as for Sales and Marketing. Directions ASIA 2018 is the second edition of the event in Asia. In 2018, the expected number of attendees is to reach 500. The 2017 conference brought together 340 attendees from 118 companies from 32 countries and 27 sponsor companies. All roles in a Dynamics Partner organization are represented: Sales and Marketing employees, Business Owners, Implementation and Technical Consultants, Developers and Managers.